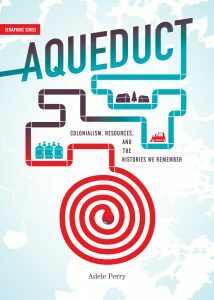 The following first appeared in April 2016 as the Foreword to Aqueduct: Colonialism, Resources, and the Histories We Remember by Adele Perry. It is with continued frustration that I note that the road which would finally link Shoal Lake 40 First Nation to the outside world—and, equally importantly, permit the creation of a water treatment facility—has yet to be built despite numerous promises to do so. At first blush, the story of the Greater Winnipeg Water District Aqueduct (also known as the Winnipeg Aqueduct) might seem of little consequence or interest to anyone except those curious about a particular time and place. But, like Adele Perry, I believe it actually represents a case study in colonialism, where the local and the global are one and the same. Across practically every dimension you can imagine, the story you’re about to read epitomizes the immoral, inhumane, and, ultimately, imperial approach Canada has perpetrated against Indigenous peoples, their lands, and, of course, their waters for well over a century. What may set this case of colonialism apart—by degree, not in kind—is the utter transparency of the injustice. Roughly a century ago, the emerging city of Winnipeg found itself in a serious predicament: it lacked a local water source to slake the thirst of its rapidly growing population. As you will soon learn, that quest ultimately led to the enactment of an ambitious and audacious plan to construct a truly massive aqueduct to permanently tap Shoal Lake so that Winnipeg residents roughly 150 kilometres away could enjoy an essential building block of public health: easy, reliable access to clean drinking water. But in so doing, city politicians and planners effectively cut off those Indigenous peoples who lived alongside and relied upon that very same lake for their survival and sustenance. For the First Nation we now know as Shoal Lake 40, the construction of the Winnipeg Aqueduct led to their isolation on an artificial island where, for nearly two decades, they have lacked access to clean drinking water. Now, to say the municipal, provincial, and federal governments and bureaucracies of the day disregarded the rights of the peoples of Shoal Lake presumes the former had much, if any, regard for the concerns of the latter to begin with. As Perry well illustrates here in Aqueduct, Indigenous peoples’ interests or preferences—basically, their very existence—never seriously registered on the radar of any level of government. More than once I was left shaking my head at the details of their arrogant actions. As for the intended beneficiaries, once that lake water flowed to the city, those who lived at its source would henceforth remain out of sight, out of mind. It is doubtful one could find a more blatant example of settlers profiting off the resources of Indigenous peoples. To put it another way, the flipside of Winnipeggers’ prosperity has been the profound immiseration of the first peoples of Shoal Lake. Or even more bluntly, one side’s loss constituted the other’s gain. So what changed? How has this 100-year-old travesty shifted course to the point where a solution to Shoal Lake 40’s water woes now seems to be at hand, and with the support of all levels of Canadian government? Honestly, that could be a book unto itself. This book is about what came before, a window into the elaborate and intricate system of colonial thought and action that infused the conception and creation of the Winnipeg Aqueduct, the kind of schema that’s endured much longer than many Canadians would care to acknowledge. As one of those “born and bred” Winnipeggers who came rather late to the story of how my city has gotten “its” water since 1919, I had no real appreciation of what quenching my thirst or taking my morning shower cost the people at the other end of the tap. That ignorance ended abruptly in June 2015, when my social media feed transmitted heart-breaking images of residents of Shoal Lake 40 First Nation left devastated by the news that the federal government of Stephen Harper had flatly refused to contribute its one-third share of the $30 million needed to construct “Freedom Road,” the road that would finally make a water treatment plant feasible for the community. A plant that would in turn bring to an end the shameful boil water advisory in place at Shoal Lake 40 since February 1997. Actions like these helped set the stage for the tripartite announcement of December 17, 2015—more or less 100 years to the day construction began on the Aqueduct—when the freshly minted federal government of Justin Trudeau joined together with the city of Winnipeg and province of Manitoba to declare their formal support of Freedom Road. Aqueduct takes us through the seminal events and key drivers of those preceding 100 years. But instead of the hagiographical narratives of yesteryear propagated by civic boosters, Perry’s account methodically exposes the removal of Indigenous resources to the exclusive benefit of a Canadian city for what it is: a massive project of empire legitimized via the logic and language of colonial erasure. There’s been no end of mainstream historians who have written off Indigenous peoples (that is, when they’ve written of them at all). It is a supreme testament then to the strength and determination of the people of Shoal Lake 40 First Nation that they have relentlessly fought such attempts at erasure, decade after decade. A more tenacious or savvy people you won’t find anywhere. A final note on “reconciliation.” It was a term much bandied about in 2015, the same year Shoal Lake 40’s situation caught such widespread attention. This was also the year that the Truth and Reconciliation Commission (TRC) concluded its mandate. And I have no doubt that much of the heady talk that accompanied the wrap-up of the TRC inspired more than a few Winnipeggers, myself included, to want to make things right with those living and suffering at the source of “our” water. To my mind, reconciliation ought to involve at least one of three basic elements: reparation, restitution, and/or restoration. As Tanya Tagaq so succinctly put it on Twitter, “My reconciliation includes an equal and opposite reaction to residential schools.” Here, “equal and opposite” serves as an apt metric for reconciliation, and not just for the lasting scars inflicted at those heinous schools. With the commitment by all levels of government to fund Freedom Road, I am hopeful that in the case of Winnipeg and Shoal Lake 40 First Nation, reparation, restitution, and restoration are well on their way to being fulfilled. But for reconciliation to truly and meaningfully take root in this part of the world, its proponents must not only look back to recognize and redress the living wounds of the past, they must also work to transition towards a new approach to “The Relationship” (between Indigenous peoples and Canada) in the present. Simply put, we will know reconciliation has been achieved when the explicit or implicit zero-sum formula for socio-economic prosperity and well-being in Canada—where one side’s gains constitute the losses of the other—is no longer in operation. To do so would mean none of us will ever again experience, or be party to, the kind of lopsided relationship Perry documents so thoroughly in the pages that follow.